Hobnob biscuits, lightly sweet oat cookies with a crunch, are one of the most popular cookies in the United Kingdom. Hobnobs are simple, but delicious, the kind of cookie one grows up with, like a graham cracker in the United States. 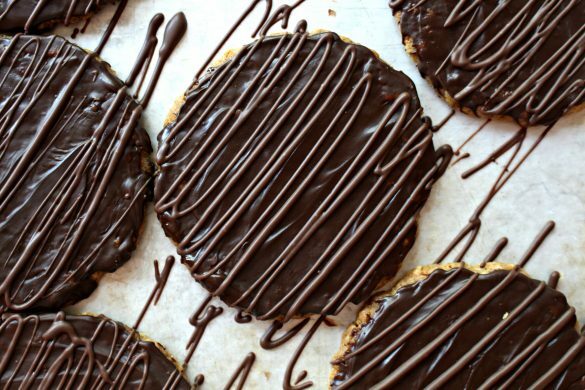 Just as Americans sometimes embellish graham crackers with chocolate, the British also enjoy Chocolate Covered Hobnobs, which turn the plain digestive biscuit into something special. 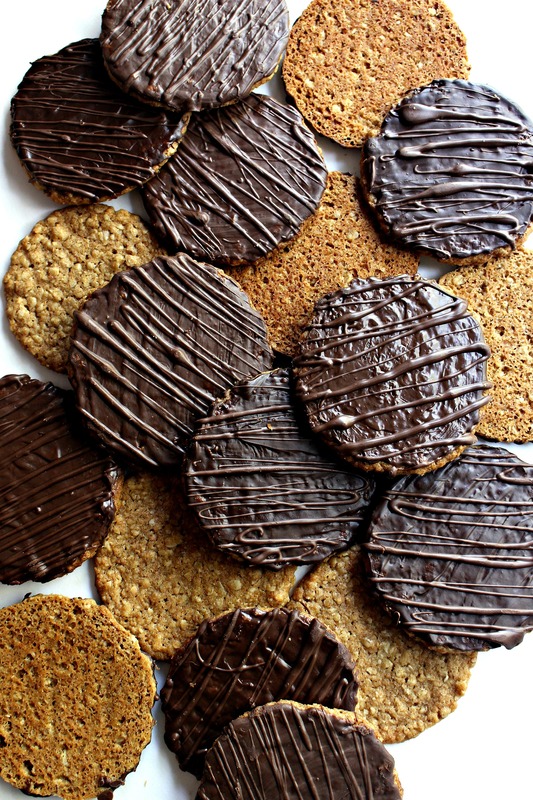 Easily making Chocolate Covered Hobnob Oat Cookies at home is extra special. This post is a good chocolate news/bad chocolate news sort of post. 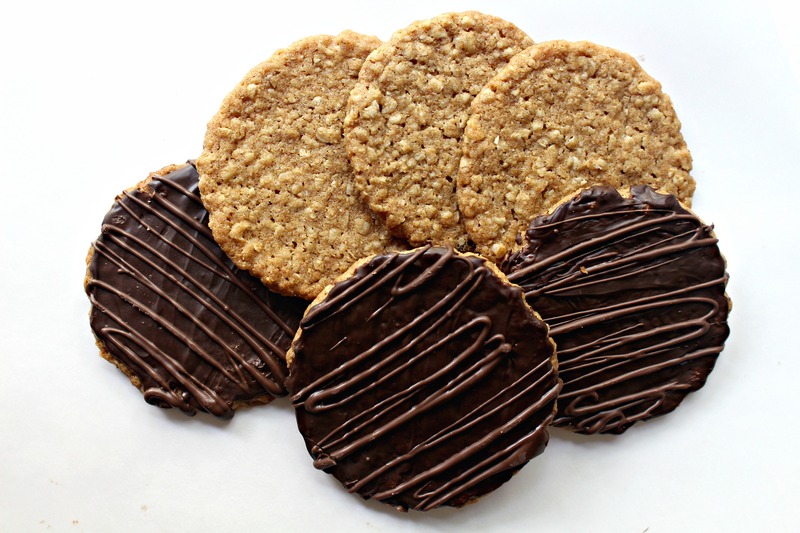 The good news is these Chocolate Covered Hobnob Oat Cookies. The bad news is that I recently discovered some disturbing truths about the harvesting of cocoa (used to produce chocolate). Warning: Ignorance is bliss. Maybe these truths are old news to you. The BBC exposed this story fifteen years ago. I have apparently been living under a rock and only this week learned that human trafficking, child slavery, and abusive labor practices are widely used in West Africa in the harvesting of 70 % of the world’s cocoa. That is why the fair trade label is so important on chocolate. The label lets the informed consumer know that no slave labor was used the production of that chocolate. Instead of routinely writing a post describing the care package virtues of Chocolate Covered Hobnob Oat Cookies, I spent the last week researching and reading about the atrocities, poverty, politics, and change in the cocoa/chocolate industry. The reading changed my perspective toward the chocolate chips, cocoa, and chocolate bars in my baking cabinet. Major chocolate producers, including Nestle’s, Mars, Hershey’s, and Ferrero (Nutella) have pledged to work toward improving the human suffering involved in the West African cocoa trade. 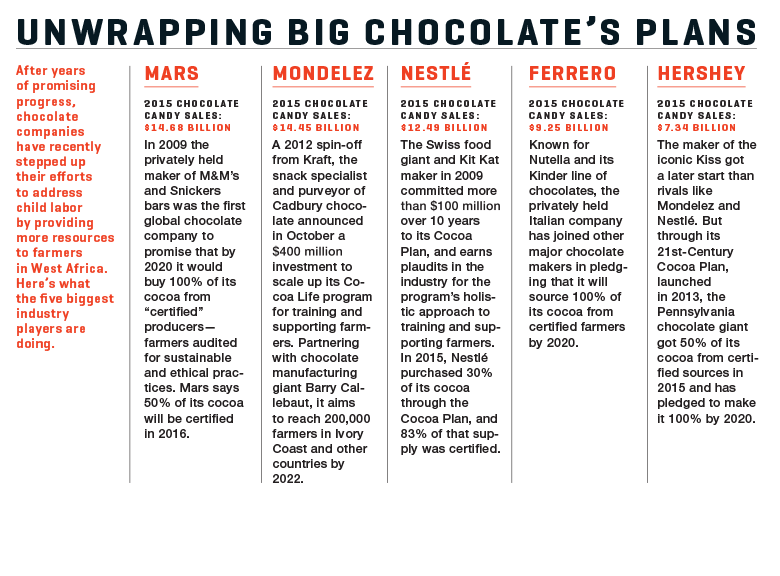 Several of the companies have pledged that by 2020 100% of their cocoa will come from farms certified for human rights compliance and sustainable agricultural practices. This infographic from Fortune Magazine helpfully consolidates many facts. I also learned from information I found on Huffington Post , SlaveFreeChocolate.org, Fair Trade USA, and Oxfam. Read the reports. Do your own research. Halloween candy bar season is here. Each person has to choose for themselves how to respond to this information. We define our own moral codes. I am sharing this information because I feel strongly that it is important to make a conscious, informed choice. This is my choice. I applaud the major chocolate manufacturers for making the changes necessary to ensure that they meet their pledge goals, ensuring all cocoa purchased is from fair trade, slave free sources by 2020. Until 2020, I personally can not buy chocolate that is the product of child labor and slavery practices. From now on, Monday Box recipes will be made only with (what is to the best of my knowledge) ethically produced chocolate. There are many bean to bar, organic chocolates that, though delicious, can be a lot more expensive than supermarket Nestle’s or Hershey’s brands, and may not be the best choice for everyday baking. Ethical practices can be more expensive. However, not all ethically produced chocolate is costly. In the next few months I will be trying brands of cocoa and chocolate chips I haven’t used before. I will let you know what I discover. I am delighted that I can report right now that my favorite dipping and coating compound chocolate, Bada Bing Bada Boom, made by Chocoley.com, is ethically produced. The ingredients for Chocoley compound chocolate is sourced from Southeast Asia, using sustainable agricultural practices, and harvested slave-free, on farms providing fare wages. 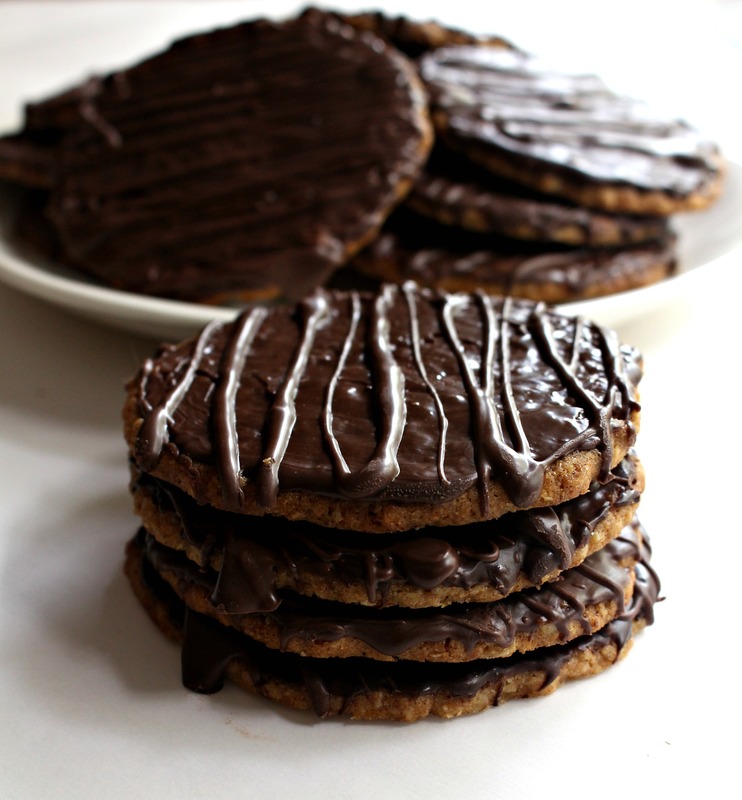 So these Chocolate Covered Hobnob Oat cookies really are good news! The crisp, oat cookie has wonderful flavor all on it’s own, a combination of nutty oat flavor and caramel sweetness. The recipe calls for Lyle’s Golden Syrup as the sweetener. For those not yet familiar with golden syrup, this British favorite is a thick sugar syrup with the consistency of honey and a buttery, caramel flavor. Though honey or corn syrup work as a substitute, Lyle’s is readily available in the United States at World Market and many local grocery stores. I highly recommend keeping a bottle on hand! Adding a chocolate coating takes Hobnobs up a notch on the wonderful cookie scale. 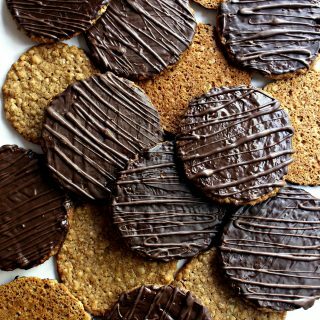 In the UK they might put the kettle on for tea with a plate of Chocolate Covered Hobnob Oat Cookies (though they would call them biscuits). In the US we might be more likely to brew a pot of coffee, or pour a glass of milk, to go with these crunchy oat cookies. 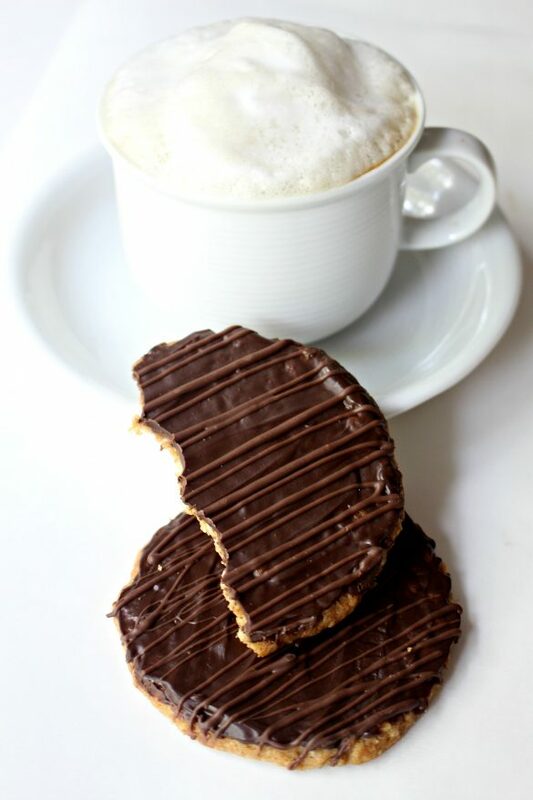 Whichever your beverage of choice, Chocolate Covered Hobnob Oat Cookies are a delicious cookie choice! In a medium bowl, whisk to combine the oats, flour, baking soda, baking powder, and salt. Set aside. In the bowl of an electric mixer, cream together the butter and sugar. Mix in the golden syrup. Gradually beat the oat mixture into the butter mixture. Using a small (1 tablespoon) scoop, portion dough onto the prepared baking sheet about 2 inches apart. Press the dough balls into ¼ inch thick discs (about 2 inches in diameter). Cool completely on baking sheet, before storing or topping with chocolate. Melt dark chocolate discs in the microwave at 50% power for 1 minute. Stir. If not completely melted, return to the microwave for 10-15 seconds. Repeat stirring and melting until all of the discs have melted. For best shiny results, work in small batches of 4 cookies. Thinly spread about 1-2 teaspoons of melted chocolate on top of each cookie. Place in the refrigerator until set. 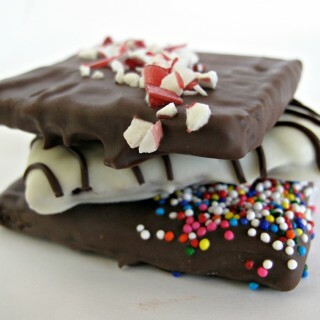 For a lighter color of chocolate drizzle, add white chocolate discs to the remaining melted dark chocolate. Microwave at 50% for 30 seconds- 1 minute or until melted. Using a spoon, drizzle the lighter colored chocolate over the dark chocolate. Refrigerate again to set the drizzle before storing. May be stored for at least 2 weeks at room temperature in an airtight container with wax paper between layers. 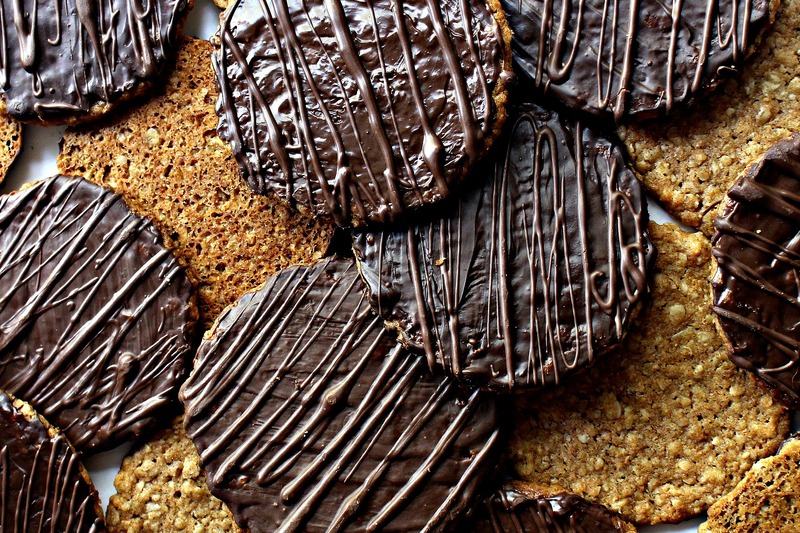 Hobnobs without chocolate topping are excellent care package cookies year round. Only use chocolate topping during cool weather. Wrap pairs of cookies, bottoms together, in plastic wrap before storing in columns in an airtight container or zip lock bag. Alternatively, layer cookies with wax paper in an airtight storage container, using crinkled waxed paper on the top to ensure that there is no wiggle room. Wrap the entire storage container in plastic wrap. 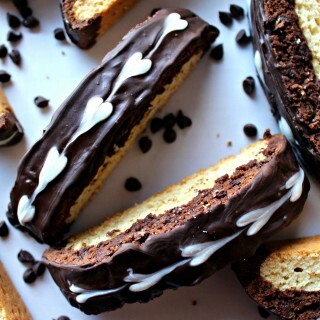 Looking for more chocolate dipped treats? Enjoy these! Wendy, thanks for taking the time to research all of this. It’s sad but also encouraging that these big companies are making an effort to change. The cookies look wonderful and you’re right, they are a favorite of every British child (and the old folks too!). Thanks, Chris! I thought of you and your British crew as I made these. 🙂 The chocolate situation shocked me on many levels. That it exists. That I didn’t know. That it is so under reported. 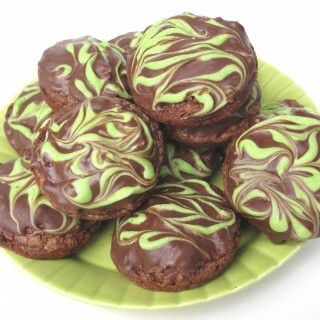 Your cookies remind me of Ireland. We ate these for lunch some days as we drove all over the island – both times! I have heard of fair trade practices but your research is eye opening. Thanks for the information. Well clearly I have been sharing that space under your rock. I had no idea and was shocked as well that I could be so ignorant about an ingredient I am so passionate about. Thanks for opening my eyes. I immediately went on my chocolate supplier’s web site to see if I could source fair trade for the brands I love (Callebaut and Valrhona). Both companies have some fair trade products in their product lineup, but not all their products are fair trade. The fair trade sells at 2X the cost of the “non-fair trade”. I need to decide if buying the fair trade version of these brands is doing enough, or if I should be boycotting these brands until all their products are fair trade. Hobnobs are one of my favourite cookies and I agree, Lyle’s Golden Syrup does not get the love or recognition it deserves! That cappuccino and plate of hobnobs make me wish I could just pop over for a visit! I am sorry, Cindy. I wasn’t kidding when I said, “Ignorance is bliss” ! I am struggling too with my new found knowledge and what to do with it. It’s so far reaching, and disturbingly under reported. On a bright note, I am on a one blog crusade to give Lyle’s Golden Syrup the love and recognition we feel it deserves! I love the smooth toffee flavor it gives these Hobnobs! Wow, Wendy. Your research is eye-opening! I knew a little but had no idea of the true extent of the problem surrounding chocolate. It makes us all think twice about the products we use. I’ve become much more careful in the last few years about what chocolate I use because of all the points you mention! It was eye-opening when I first heard about it! Anyway, I have never heard of hobnob cookies but I like the sound of them! Would be perfect with my afternoon cup of tea! These are amazingly beautiful cookies! Thanks, Michelle! I love the toffee undertone from the Lyles Golden Syrup! Thanks for doing the research and opening our eyes! I feel so bad for them. I’m glad to see some of the big companies are trying to use more ethical sources. I will have to research Ghiardelli which is mostly what I use. The cookies look delicious – what a treat covered in chocolate! I could easily devour a stack of them.